A major benefit of using the Skooler LMS is that it allows staff, teachers and students to use the familiar Microsoft Office applications in a way that’s completely integrated with the LMS. Because Microsoft Office comes in three different forms – Office desktop, Office Online and Office 365 (all supported by Skooler) – we thought it might be helpful to go over some of the key differences between them. Let’s start by explaining each type of Microsoft Office, then we’ll go over a few of the similarities and differences. Microsoft offers Office 365 Education free to teachers and students – simply sign up with a school-specific email address (for example yourschool.edu)*. This subscription-based version of Microsoft Office supports both online and desktop use and includes Office Online (Word, PowerPoint, Excel and OneNote) along with cloud storage (the amount of storage you have may vary depending on your school). You don’t need to have Office for the desktop in order to use Office 365 – you can work totally online, however the features in the online version differ somewhat from the full set of features in the desktop version. More on that below. Some schools also allow teachers and students to install the full Office desktop applications on up to 5 PCs or Macs for free – this is something to confirm with your school. Office 365 will automatically save and sync online documents with your desktop. Schools, teachers and parents can sign up for students who are not of legal age to register for online offers. 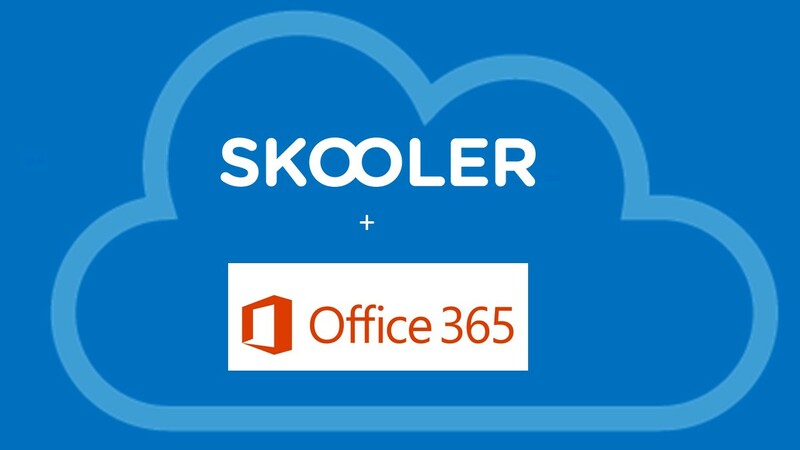 Skooler + Office 365 gives you the most flexibility. With Office 365 you can share online files, so teachers, parents and students can see assignments and feedback. Students can also collaborate with each other on documents or presentations and use OneNote shared notebooks. Office 365 with Office Online also lets schools take advantage of the Microsoft Teams features available through Skooler. Office Online is a free version of Microsoft Office that can be used in a web browser – with a desktop computer, tablet or mobile device. Users only need to sign up for a free Microsoft account. Office online doesn’t offer the full feature set of Office desktop. Skooler + Office Online lets you work on documents from anywhere on any device. While it doesn’t offer the full feature set available in the desktop version of Office (see below), when you use it with your free Office 365 Education subscription, Office Online makes it easy for students, teachers and parents to view and edit their Office documents and OneNote workbooks on the go. This is a one-time purchase of the Microsoft Office software that runs on a single computer, either Mac or PC. Schools that have invested in Microsoft Office licenses for each computer in their school will sometimes need to update the versions of the software in order to keep up with the current features. The latest desktop version of Microsoft Office is Office 2019. Skooler + Office for the desktop. Skooler works with Office for PC desktop versions back as far as Office 2013 and as far back as Office for Mac 2016. But in order to use online features, such as collaborating on documents and shared OneNote notebooks or to use Microsoft Teams, users will need to login into their desktop version of office with an Office 365 Education account. If you’re used to working with the desktop versions of Microsoft Office programs, you’ll find there are some differences between the features you’ll be able to use in Office Online vs. Office on your desktop. Rather than outline all the features in the Office desktop apps (there are so many!) we’ll share a few of the things you can and can’t do with the Office Online versions. If you have Office 365, you will always have the option to “Open in Word” or “Open in Excel” (likewise with the other desktop versions of the applications) when you want to access a more complete feature set. Versions of documents, spreadsheets, presentations and OneNote notebooks are stored online – usually in OneDrive or in SharePoint, depending on how your school has set up Office for you. If you’re using Microsoft Word Online, your document will be shown in Editing view, which allows you to edit and format text. This view doesn’t show the page formatting features like margins, headers, footers, page breaks or cover pages. • Co-authoring: This is the killer feature of Word Online that you can’t do with the desktop version alone. With Word Online, multiple authors can work simultaneously in the same document – making collaboration fun and easy (and far more useful than sending revisions to each other in email)! • References: You can check the spelling of documents and set the proofing language in Word Online, however it does not use a custom dictionary and does not include grammar checking, translation or a thesaurus like the desktop version does. • AutoCorrect: Just like the desktop version, Word Online will correct common spelling mistakes as you type, and if you don’t want a correction it makes, press Ctrl+Z to undo it. Unlike the desktop version, however, Word Online does not include a way to customize your AutoCorrect options. • Copy/Paste: You can copy and paste items from the web, including text and pictures. Text will automatically be formatted to match the text surrounding it in Word Online. • Formatting: Features in the online version include: bold, italics, underline, strikethrough, subscript and superscript. You can adjust font, size, color and highlighting and you can clear formatting. • Paragraphs: You can align paragraphs left, right or centered and you can even run text from right-to-left or left-to-right. You can increase or decrease indentation, adjust line spacing and format paragraphs as bulleted or numbered lists – note, there aren’t as many style options for bullets and numbering in the online version as there are on the desktop. • Tables: Word Online lets you insert tables and select by table, column, row or cell; but you can only delete by table, column or row (not cell). You can insert rows and columns and align cells left, right or center. But if you like more sophisticated table features like styles, cell size, text direction or sort order, you will be able to view them if they were created on the desktop version, but you cannot configure them in Word Online. • Pictures: You can insert pictures or clip art stored on your computer or from Bing. You can also apply some pictures styles, write alt-text and change the size, but you cannot drag pictures to a new location (you’ll just have to cut and paste). You won’t be able to do more sophisticated picture editing features like cropping in the online version. • Shapes, Charts, Text Boxes, SmartArt and WordArt: If your document was created in the desktop version, you will be able to see them displayed in Reading view. In Editing view, they will appear as placeholders that you can delete but not edit and you cannot move or resize them in Word Online. • Styles: If you like to use Styles in Word, you will find you can apply styles in the online version, but you cannot create new styles or modify existing styles in Word Online. • Find but not Replace: You must switch to Reading view to use the find feature. You can find words, but there is no replace option in the online version. • Page Layout: This works a bit differently online. In Reading view you can see breaks between lines and pages, but in Editing view line breaks and paragraph breaks look the same and you do not see page breaks. Headers and footers (including page numbers) display in Reading view, but they are hidden in Editing view. If you have created columns in a document that was created on the desktop, they are preserved in the online version, however you cannot edit the columns. • Footnotes and Other References: Footnotes, endnotes, bibliography, table of contents and index display as expected in Reading view, but in Editing view they appear as placeholders that you can delete but not edit or update.